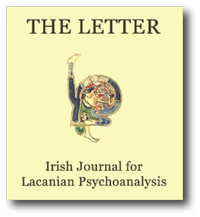 It is worthy of note that in this issue of The Letter all the articles have been the outcome of work in the cartels of the ISLP, thereby actualising the assurance of The Founding Act that what is written by members of the cartels will have ‘the repercussions it deserves’, and in the appropriate place. In conjunction with one’s own personal analysis, Cormac Gallagher emphasises the role of the cartel as the field of central importance in the formation of the analyst. Firstly he sets out his interpretation of the way in which cartels are structured in order to further this crucial role of formation. Then he extrapolates from the record of the discussions on the Cartel Study Days, in Paris, of 1975. It shows the failure to implement the policy of the School as specified in the Founding Act, Adjunct and Preamble, and contextualises the difficulties which had arisen. Finally he gives a brief account of the status of the cartels to-day, which is one of absence, with the exception of the experiment of the ISLP. Guy Le Gaufey’s comment as quoted in the text that this paper is ‘one of the best, the most complete I’ve read on this topic…[and that] it could be considered as a sort of “founding” paper for the ISLP’, is entirely apt. In his Founding Act (1964) Jacques Lacan established a School organised around small working groups tasked with enabling each individual to produce written work. Their radically innovative character lay not just in a curious name – cartel – but also in the very tightly defined structure requiring a strict limitation of 3–5 members PLUS ONE as well as an obligation to permute on a regular basis. For almost half a century attempts to implement this apparently well-defined project have met with successive failures caused mainly by a confusion, partly cultivated by Lacan, around the real or imaginary status of this plus one and its function in promoting the work of the cartel…..
Patricia McCarthy – What is an Author…. a Question for the Cartels? After a year‟s experience of being part of one of ISLP‟s cartels, the question of authorship emerged, not in the sense of plagiarism or of who can claim ownership over an idea or a text. Our question about authorship centres on the big Other, the field of a knowledge devoid of subjectivity, unconscious knowledge where one does not know who it is that knows. The co-ordinates of the big Other, understood as utterly distinguishable from the One, will be questioned with reference to Foucault‟s address to the Collège de France, entitled „What is an author?”. This is a necessary preliminary to grasping the full power of Lacan‟s four discourses.…..
Barry O’Donnell – What might a School be? This paper is a response to Lacan‟s reference to the ancient philosophical schools when he was launching the school in 1964. It aims to shed light on the reference through a consideration of material which describes the ancient schools. This material indicates that Lacan‟s school differs in its arrangement and aims from other educational and training institutions. In one of the closed seminars during the Crucial problems for Psychoanalysis Seminar, in January 1965, just some months after the act of founding L’Ecole Francaise de Psychanalyse / L’Ecole Freudienne de Paris Lacan indicates that it is „a school ….. This article contrives to illustrate the fact that committing oneself to participation in a cartel requires an informed leap into the unknown; that operating in obscurity demands radical questioning of received as well as preconceived ideas; that words and meanings outside Lacan‟s texts are limited, and inside, incomplete. Yet in the „not-alls‟ and the „half-saids’ of the cartel we can form a social bond… by way of the psychoanalytic discourse.